If the rumors are true, the finale will, much like this episode, end on a cliffhanger that’s going to piss a lot of people off. After watching this episode I could see in my minds eye the eruption of the internet about the fates of those involved. We’ll see if I’m right about that reaction. “East” goes out of its way to show how comfy & happy Rick and Michonne have gotten…which is never a good sign. We also find out too that Tara has no idea yet about Denise, something I had wondered before. She’s still out on her supply run. “East” continues the story of Carol’s leaving Alexandria and trying to run away from the ghosts that haunt her in a land filled with the dead. But as we’ve learned, the living are who you should really be afraid of. It seems Carol can’t help but be a badass, even when she doesn’t want to. When a group of Saviors try to muscle her, she takes them all out save one who’s left in a bad way…but who starts following her when the leaves the scene. Daryl on the other hand is out to find Dwight and finish what he should have before. Since the gang can’t just leave well enough alone, Glenn and Michonne along with Rosita follow Daryl while Morgan and Rick go after Carol. Morgan and Rick discuss their differences of morality once again, and on which side of that line Carol is now falling. Rick’s mind is that Carol, as I said, can and will be a badass if need be…even when she doesn’t want to do it. You have to wonder how much that will to live is going to stick around with what it is obviously costing her each time. They go after her trail and we get punk’d by a Carol Walker look-a-like because we’re at the end of the season and TWD gives no f***s about our emotions which are already on edge. Rick and Morgan arrive at a farm house with a gent that’s surrounded by Walkers and is looking for his horse (oh god….not another horse…I can’t take another horse.) Things go south (even though this episode is called “East”) and when the man escapes, Rick ponders (after seeing he was using a weapon like the ones the Saviors had) if he was in fact one of them. You have to wonder if this attitude is helped along with his new relationship with Michonne which he has an interesting conversation with Abraham about. Both of these guys have lost their entire families and are now finding someone to actually care about. Further evidence that Abraham really was just using Rosita, but also interesting to see these two bond over something that personal. Morgan finally admits to Rick about The Wolf and what happened with Denise and the prisoner wound up saving her. He says “everything is a circle” and how every action gets an answer. Yes Walking Dead we hear the foreshadowing loud and clear. 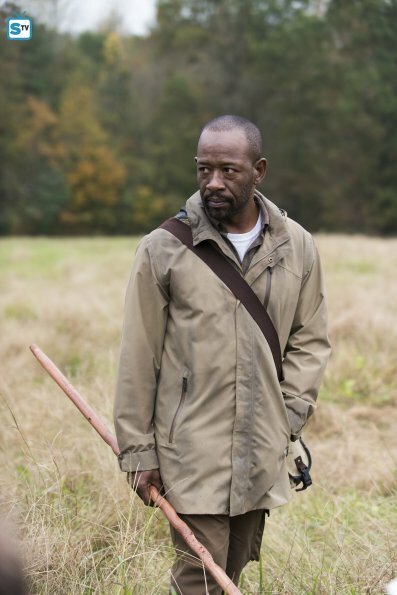 Morgan sends Rick back to Alexandria and goes off to find Carol. This no doubt leads to him finding the horse and the image of Morgan on one. We can hope for his knight in shining armor moment and I can hope for the horse not being devoured again nastily. 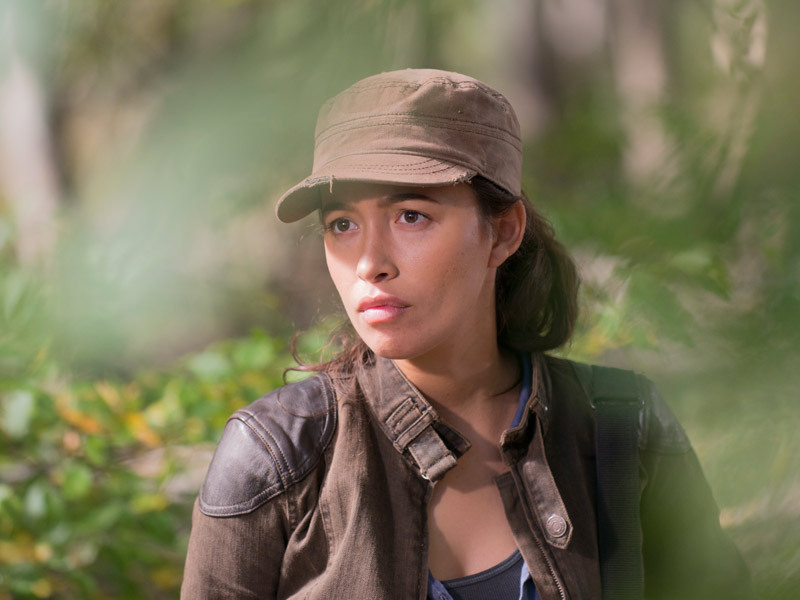 Meanwhile Daryl and Rosita decide they owe it to the memory of Denise to take out Dwight and his merry band. After Glenn and Michonne try to talk them out of doing it alone, they eventually leave them. Glenn and Michonne are of course taken hostage because Dwight is apparently a ninja, even in broad daylight. Rosita and Daryl are ready to attack and free the duo when wild Dwight appears like a half burned Pokemon and in a moment which will set fire to all the twitter shoots Daryl point blank with blood splattering on the camera lens and mutters “You’ll be fine.” as the screen goes black. As I said, no f***s are left to give this late in the game. Oh and lets not forget the fact that Maggie’s hair cut apparently spurred on a possible miscarriage which we are left to wonder how that will go. Will we finally get my sick and twisted idea of a stillborn baby chewing its way through a mom? Because that’s something I have wondered about for a while, even back with Lori. Because I’m sick and twisted. We’ve already been told the finale is going to destroy EVERYONE…so yeah, that would be one way to go with it. “East” isn’t really all that deep. It’s basically a bridge and setting up for the finale which, thanks to our friends in Europe, we already know will be the first appearance of Negan (we already knew he’d be there but now it’s super confirmed.) All of these dominoes are now in play and heading towards a major conclusion. “East” is all about ramping up the tension even further so at this point every person invested in anyone on this show is going to be shaking and neurotic through next Sunday. If the rumors are true though, that neurosis may continue on until October. The word is that Negan shows up, brandishing Lucille, and the camera cuts to the point of view of whoever he’s getting ready to smack down. Which means we have no actual idea of WHO that is. And the episode ends. If this is in fact true I would have said “that’s freaking brilliant” BEFORE the whole Glenn debacle earlier this year. Fans will only take so much of this bait and switch and if they do this the outrage and outcry will break Twitter and every other form of social media. I guess we’ll wait and see. All I know is that my body is ready for Jeffrey Dean Morgan to swagger on that screen as the embodiment of mean a mean mother. Next weekend will be here before you know it…and we’ll see if there’s a riot. Another (2012) – Horror Anime Style! Burnt Offerings (1976) – The Review! It seems that The Walking Dead people have a death wish. When they have killed enough of the main characters off, who is going to watch? Never mind riots and all that silly stuff.